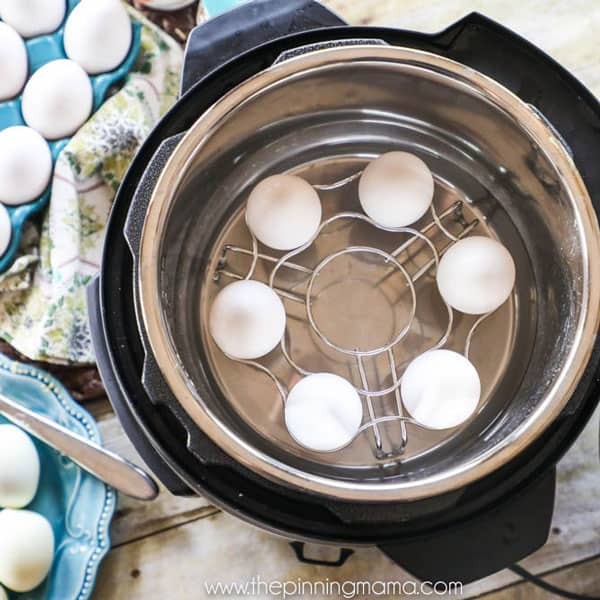 The easiest way to make hard boiled eggs is in the Instant Pot using this method! 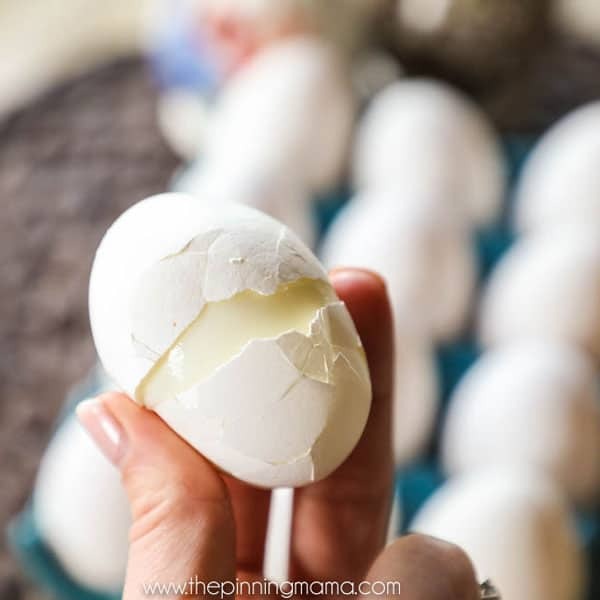 Not only do you have perfect eggs in just a few minutes, but they also peel easy every time! You will never make them in any other way! I have done a lot of pin tests here over the years, finding something people are raving about on Pinterest and then testing it out to see if is is really as great as they say, or alas it was too good to be true. 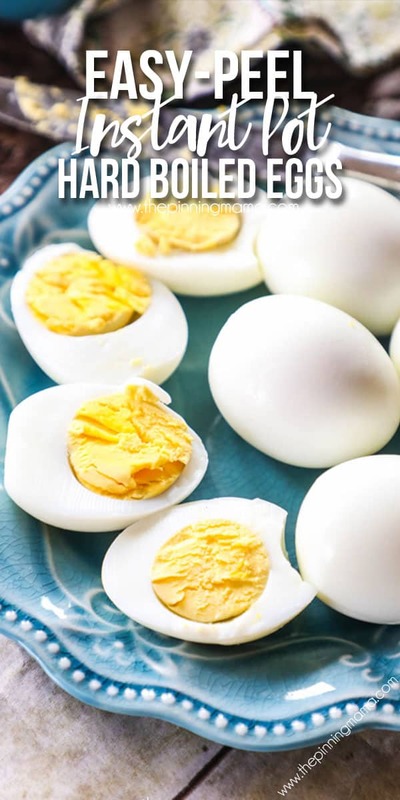 This isn’t exactly a pin test, since I didn’t find it on Pinterest, but people are talking about these hard boiled eggs all over Facebook, so I had to put it to the test and see what they hype was really all about. Not one person used the same method! Seriously! Each person that recommended it had a slight variation and then in the comments there would be 20 more ways. This was seeming a bit overwhelming. Why were there so many methods, and in come cases so many steps just to make a hard boiled egg? I decided that it was hard boiled eggs, and that should be simple, so I was going to start out with the most simple method and then adapt as needed. Overall, I made the eggs six different ways and learned a lot along the way I am excited to share with you! *Disclaimer- I am still pretty new to my Instant Pot. I have been playing with it and make quite a few meals in it for my family, but I am not a pressure cooking expert and please forgive me if I use any terms that are not 100% correct. I am just doing my best to explain what I learned and works for me in words that are easy to understand. 1 cup of water in the bottom. I ran a couple under cold water to cool it off enough to handle, and the rest cooled naturally. Both had the same end result. Easy right?! Well, let me tell you, I got lucky because they came out PERFECT! The eggs were perfectly cooked, the centers were a firm but creamy yellow. There was no dark ring around the outside of the yolk. They tasted like a hard boiled egg. The BEST part was that they were easy to peel. I mean ridiculously easy. Once I cracked the egg, the shell almost just fell off. That my friends is what had me fall in love with this method! How do boiled eggs on the stove compare to the Instant Pot? So now, were the different or better than other hard boiled eggs? Let’s take a look. Time spent making the eggs: About the same. When I hard boil eggs on the stove I put them in cold water, bring it to a boil for a few minutes then cool it down in an ice bath. In the pressure cooker, it was 10 minutes but there was still about 5-10 minutes to pressurize. I didn’t time it down to the minute or second, but it was close enough to know that it was really negligible. Ease of peeling: Instant Pot wins HANDS DOWN! There are times when my stove top eggs peel easily, but if I am honest, I might have better luck on the tables in Vegas than betting on if my stove top eggs will peel easily. And to me there is nothing more frustrating than making a huge batch of eggs, only to go to eat one and find that you lose half the egg trying to get the peel off and spent half of eternity over the sink just to get that half an egg. This right here is what makes the Instant Pot eggs 1000% better! You know exactly what you are going to get! With that said, if you have a tried and true method, and get perfect peel eggs every time you make them then this might be about equal for you too. Taste and Texture: Again about the same. I think it is possible to make great eggs either way. I will say that making the eggs in the Instant Pot seemed to have less variation than I have on the stove. There was no guessing if they were done, or oops, I left them on too long and they got a gray ring. I think if you cooked them for 10 minutes in the IP then missed the timer and let them natural release for awhile, that you might also experience that, but I didn’t on any of my eggs. Number of steps– About the same. When I hard boil eggs, there is basically 2 steps, first putting the eggs on to boil and then taking them off and putting them in the ice bath. Pretty simple! When I do them in the Instant Pot it is also 2 steps. First, putting them in the pot and turning it on, then second, doing the quick release and opening the pot when the timer goes off. Number of eggs cooked– Stove top wins! When using the trivet I could only cook 6 eggs at a time. When I tried an alternate method, I cooked 14 at one time successfully. I might have been able to cook more, but I haven’t tried it yet! On the stovetop, I can easily fit 2 dozen+ in my large pot, so I think that the stovetop does win if you are looking to cook sheer volume. Instant Pot Eggs- Trial and Error! Now that we went over all of that, let me tell you a little bit about the other 5 methods I tried. The good news is that overall, none of them were a huge failure and they all produced pretty decent eggs. 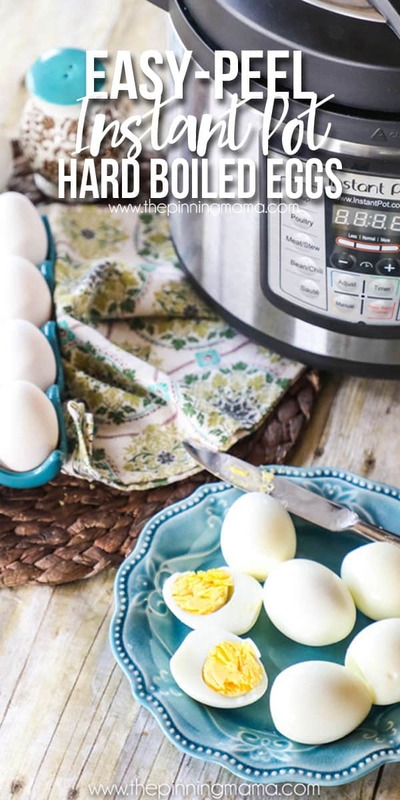 Read: It is pretty hard to mess up hard boiled eggs in the Instant Pot! I love dummy-proof! After I made the first batch I was very excited about how they came out and mostly how easy they peeled. Then I realized that I only had 6 of them and had already gone through three, so I thought I needed more. Back to the Instant Pot for round 2. I figure if it worked perfectly the first time, then why not just repeat it for the second. I repeated the process from the first time and set it to cook. When I opened the pot this time, 2 out of 6 of my eggs were cracked. I am almost certain that this is because the pot was still hot when I put them in for the second time so it came to pressure much faster. The cracks were pretty minor and didn’t effect the edibility of the egg, but still, no one wants cracked eggs if you can prevent it. I tried again, and this time rinsed the pot so that it was nice and cool and again set it to the same settings. This time perfection again! Lesson learned: Cook the eggs in a cool pot, do not cook them in a pot that is already warm. OR cool down the pot in between batches. Then my kids came in and started devouring the eggs. So I decided I needed to make a big batch. I read about using a vegetable steamer for other things in the Instant Pot so I figured why not try that as the holder for my eggs. The trivet was kind of perfect, but only held 6 eggs max. My vegetable steamer is silicone, and luckily perfectly sized to fit in my Instant Pot. I placed the steamer in the bottom of the pot, then added a cup of water. I was able to fit 14 eggs in a single layer on the trivet and cooked them as I did before on manual for 10 minutes. With a quick release, they were ready! They turned out just as well as the first batch, minus one egg with a very small crack. I think you might be able to do multiple layers of eggs on the vegetable steamer to cook a greater quantity, however, I think you might need to increase the cook time once they are in a thicker layer. Overall, I thought that it was a success cooking on the vegetable steamer, and have made them that way several times since I tried it the first time. When I need more, I tend to use the method above to cool down the pot and cook another batch. On one batch of eggs I made, I missed the timer going off and it ended up on Natural Release for about an extra 7-8 minutes. These eggs came out pretty much exactly the same, easy to peel, done all the way through, BUT there was a slightly gray ring around the yolk indicating that they were probably a little over done. They still tasted about the same though so we ate them! I think you could easily do a hard boiled egg with a natural release but you would need to reduce the cook time from 10 minutes. For me, it seems easier to just keep track of one time, so I will be sticking with my primary method. Well if that wasn’t more words than I ever thought I had to say about hard boiled eggs, then I don’t know what is?! I will be using my Instant Pot from now on to make my hard boiled eggs. That easy peel just has my heart! I hope that you found this helpful and makes it easier to jump into making eggs in your Instant Pot! 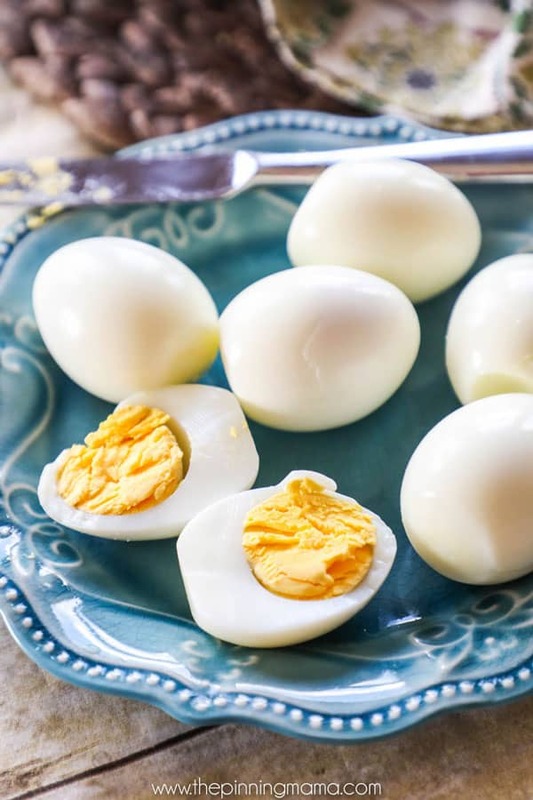 If you have any questions, or a tried and true method you love for making hard boiled eggs, please share it with me below in the comments. Arrange eggs in a single layer on the trivet or steamer. Close lid, set to sealing. Choose manual and adjust the time to 10 minutes. Cool eggs by running under cold water to eat immediately, or let them cool naturally on the counter or fridge. 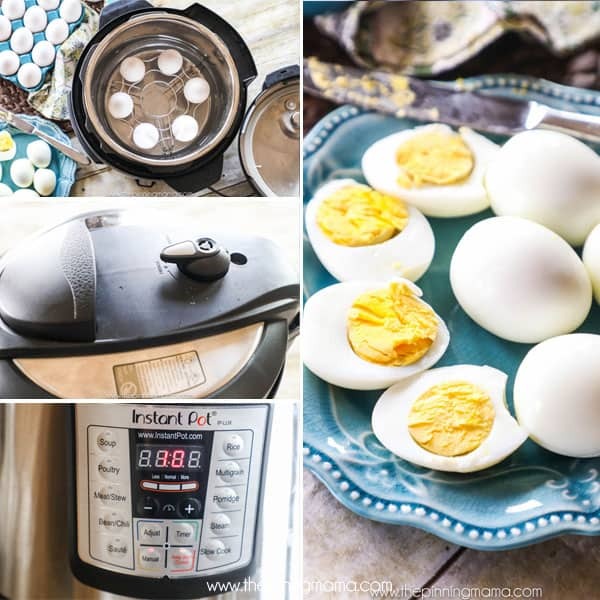 I love my Instant Pot and I love all the different varieties in egg cooking time! I do a 5-5-5 method. 5 minutes high pressure, 5 minutes natural release (then quick release the rest), then 5 minutes in an ice bath. Perfect every time! Seems to me that a significant detail’s missing from the instructions, but maybe not. Doesn’t matter if eggs are straight from the fridge as opposed to room temp? Thanks for all your research & reporting on results; very helpful. You need to try the egg log, crack the eggs in a well greased dish. I usually do 6 eggs in a bowl and a dozen in the pot at the same time. You may need to pat the top if the steam left a little water. Eggs for salads without peeling! Or do the potatoes in the lower level and set your bowl on top. The instructions show 12 hours for the eggs :). I have my stovetop method down, but the eggs are very hard to peel. Can’t wait to give this a try. Can you link your vegetable steamer you use?